We sat down with UK pop band The Vamps before their album release show at Webster Hall in New York City and talked pre-concert rituals, their new album “Wake Up”, and what fans can look forward to in 2016! Watch our interview with Connor, James, Brad, and Tristan below. Pick up a copy of “Wake Up” on iTunes or Amazon now. Read our recap of the album release show here! Be sure to follow The Vamps & Secret Fangirls on Twitter for more updates! 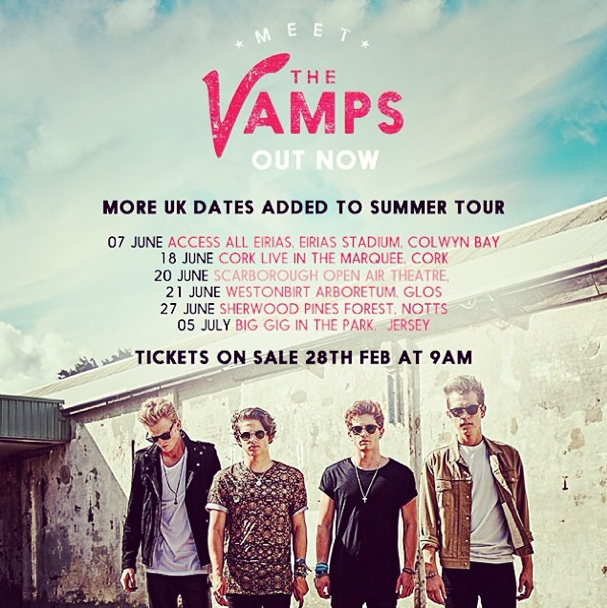 The Vamps just announced a string of brand new tour dates for this summer around the UK! Following the release of their now platinum debut album and opening for Austin Mahone and Fifth Harmony in the US, the Brits are returning home to headline some pretty huge stadiums with some very special guests. Check out the new summer tour dates below. Tickets go on sale February 28th! Pick up a copy of “Meet The Vamps” on iTunes or Amazon so you can sing along all summer long! Be sure to follow The Vamps & Secret Fangirls on Twitter for the latest on your favorite artists.